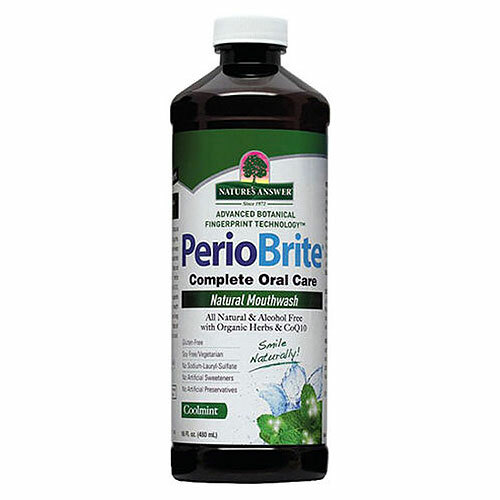 Daily cleansing and rinsing with PerioBrite Natural Mouthwash helps promote healthy teeth and gums. This great tasting mouthwash does more than keep breath fresh and clean - it promotes periodontal health. It`s also fluoride free! Dentist formulated PerioBrite Natural Mouthwash contains soothing organic herbs well-known for their cleansing action, while Co-Q10, Folic Acid, Oregano, Cinnamon and Clove supports tissue and gum health. As part of an oral health programme, it naturally moistens gum tissue for long lasting, effective results. PerioBrite Natural Mouthwash energises your whole mouth with a cool, sparkling minty-fresh sensation. Water, Glycerin, Xylitol, Bio-Saponins (Yucca schidigera Root Extract, Quillaja saponaria Root Extract, Dioscorea villosa (Wild Yam) Tuber Extract, Smilax regelii Root Extract), Mentha piperita (Peppermint) Oil, Calendula officinalis Flower Extract, Echinacea purpurea Flower/Leaf/Stem Extract, Chamomilla recutita (Matricaria) Flower Extract, Phytoplenolin (Centipeda cunninghamii Extract), Centella asiatica Extract (Gotu Kola), Origanum vulgare Leaf Oil (Oregano), Zanthoxylum americanum Bark Extract (Prickly Ash Bark), Lavandula angustifolia (Lavender) Oil, Thymol, Eugenia caryophyllus (Clove) Bud Oil, Folic Acid, Olea europaea (Olive) Leaf Extract, Thymus vulgaris (Thyme) Flower/Leaf Oil, Eucalyptus globulus Leaf Oil, Cinnamomum zeylanicum Bark Oil, Citrus grandis (Grapefruit ) Seed Extract, Juglans nigra (Black Walnut) Shell Extract, Ubiquinone (CoQ10), Camellia sinensis Leaf Extract (Green Tea), Rosmarinus officinalis (Rosemary) Leaf Oil, Aloe barbadensis Leaf Juice (Aloe Vera), Citrus limon (Lemon) Peel Oil, Hydrastis canadensis (Goldenseal) Extract. After brushing, rinse and swish vigorously twice a day with 2 capfuls for 30-60 seconds. PerioBrite can also be used as a gargle. For best results do not eat or drink for 10 minutes after rinsing. Shake well before use. If you are pregnant, nursing or taking any medications, planning any medical procedure or have a medical condition, consult with your healthcare practitioner before use. Do not use this product if you are sensitive or allergic to any of the ingredients. Below are reviews of Nature`s Answer PerioBrite Natural Mouthwash - 480ml by bodykind customers. If you have tried this product we'd love to hear what you think so please leave a review. Best ever mouthwash! The ingredients list is just an amazing. Fresh breath, natural herbal taste, i would say it even leaves my teeth whiter. I've just got my third bottle. Definitely i would recommend it to everyone. I've found this mouthwash incredibly helpful. I definitely see a difference in terms of the health of my mouth using this and the toothpaste. This mouthwash tastes horrible. I only used it once and I had to throw the rest of it away. It took ages to get the taste out of my mouth.